President: Aaron Pettman, pictured below with better half, wife Kamala. Third term as President of our club, former professional player, soccer dad to Alanah & Mason with Mya possibly to come. listed contact for GRFC correspondence & attends monthly meetings. 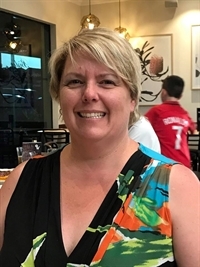 Second term as Secretary, also one of our local councillors, soccer mum to Cody (U15s) & Jett (U13s). Married to Junior VP & Sponsorship Co-ordinator, Paul Gryzbek. manage club correspondence / relationships with club sponsors. First term as Treasurer after stepping in part way through Season 2017. Soccer mum to Jordie (U13s) & Mollie (U16s & U7 girls coach). Married to groundskeeper Hillie, (Adam) & club sponsor. assist Registrar with registrations including unpaid fees, registration approval, changes etc. Joe (left below) is a current player for our State League Men & former captain of Local Div 1 Men's team. Joe will also be working with Bec as our male champion of change as part of the Barwon Gamechanger Project. Married to Secretary, Kylie. Soccer dad to Cody (U15) & Jett (U13). Miniroos co-ordinator for the past 3 seasons, looking to hand over the reigns for Season 2020 as her boys are all now past that age. Soccer mum to Dylan (DT - U17s); Lachlan (U14s) & James (U12s). 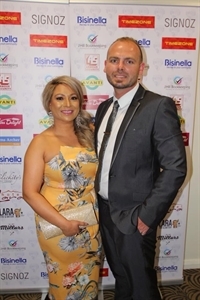 Hubby Gino's business Armour Security provides the club's security system & is a club sponsor. 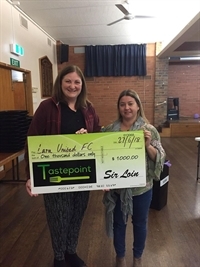 Also our canteen co-ordinator, the hostess with the mostess, looking forward to our beautiful new canteen facility in 2019.
co-ordinate miniroos galas hosted at Lara United FC, including pitch layout, receival, storage & set up of equipment provided by hub, co-ordinate volunteer roster. 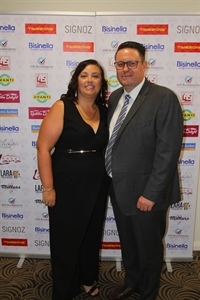 Club legend, life member, Bec, along with hubby ,former club president & newest club life member Tony has been instrumental in getting Lara United FC to where it is today. After a year off the committee Bec is back to guide us with her wisdom. Bec plays a large role in assisting Tony our head senior women's coach with the women's teams. All general committee members attend monthly committee meetings & help out as required with whatever is needed to keep things running. In 2019 Bec will be organising the playing kits, assisting with senior fundraising events & will be our female champion of change for the Barwon Gamechanger Project. 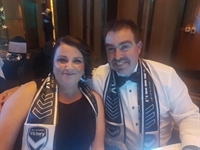 Pictured here with her fundraising teammate Pam, Michelle (right) is joining the committee for the first time but has always been a great volunteer around our club, cooking in the canteen, at miniroos galas, team managing, organising coaches kits & organising club fundraising. Soccer mum to Jade & Taz (U13s) & hubby Andrew is one of our junior coaches. Michelle will continue to work with Pam to fundraise in 2019 & has already been investigating new ideas in the off season. Our club registrar has the important role of making sure every single player is registered correctly with both the club and the association - this must be in order before any player takes the pitch. This role is hectic at the start of each season but is also ongoing throughout the year as players need to change registration levels etc. My family is fairly new to Lara United FC, with my 9yo son, Harry, only joining the Miniroos last year. He is soccer-mad so am thinking I’m probably in, to be a “Soccer-Mum”, for the long haul! I have loved being “Mum to a Miniroo” and coming along and supporting the club, but I am really excited to be coming on board as the Club Registrar and looking forward to meeting lots of our families at Lara United FC. 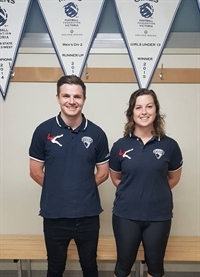 Daniel & Sam will be a conduit between the senior men & women's playing groups & the committee for Season 2019. Thanks to them both for stepping up into these roles. 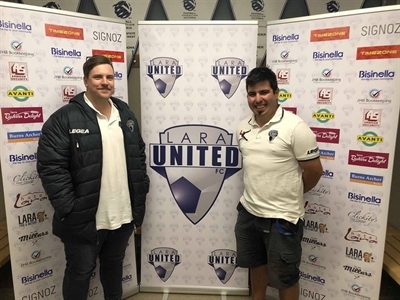 Lara United FC is pleased to announce the appointments of Jonno Perez and Eric Lawrence as the State League Senior Men’s and Reserve’s coaches for the 2019 season. 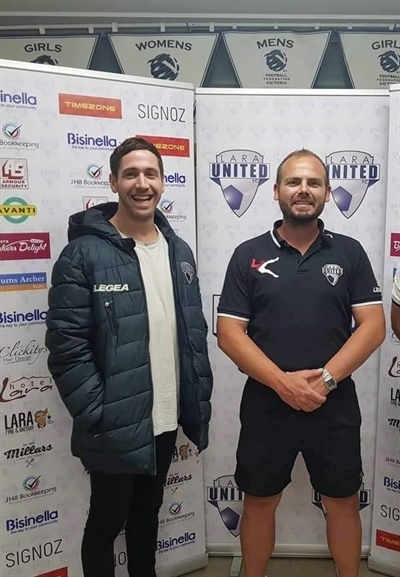 Jonno Perez is an experienced leader having spent time coaching senior men’s football at both Deakin and Barwon before taking on an assistant coaching role at Lara United. After seeing Jonno successfully take the helm as head coach for the last four games of the 2018 season we’re confident that he is the right man to take the club forward. 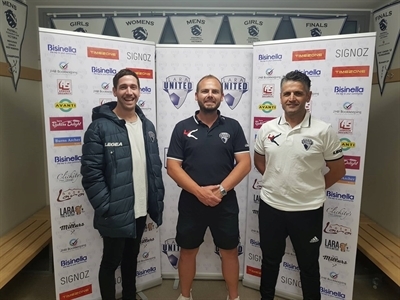 Having played senior men’s football in both State League 4 and State League 5, Eric Lawrence is excited to take on his first coaching role as the reserve’s coach for 2019. Eric began his career playing junior football for Lara before moving to Bell Park, breaking into the senior team at the age of 15. Eric enjoyed a further 10 years at Bell Park before returning home to Lara United. It is important for the club to establish a strong coaching program that can best leverage our young and ambitious playing group. Jonno and Eric’s passion for building the club culture, developing youth through the junior program, and ability to unite the playing group towards a common purpose have us excited for the 2019 season. Tony Paul Horrocks returns as our Head Women’s coach for his seventh season. Tony has coached senior women since 2009, moving from Ballarat to take on the role of senior women’s coach here at Lara United when we first entered the State League competition in 2012. This year he will once again manage our senior girls as they take on Statue League 2, after finishing in third place in the competition last season. 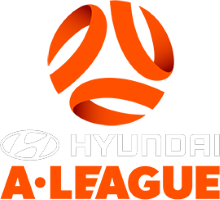 He will continue to be ably assisted by Ivan Kovacev, who has been working with Tony for the past decade, coaching in a variety of competitions from Country Championships to Victorian Champions League and the Women’s State League. We are pleased to see Ivan is making a slow but steady recovery after his skiing accident at the end of last season and are glad to have him back with us at Lara United. Our local women had a fantastic first season back in the Geelong competition last year under first time senior coach Ryan Horrocks. The girls’ success sees them promoted to Division One this year and they will take this on under Ryan’s guidance. Ryan coached junior girls at Lara United for five years prior to taking on the role of coach to the senior women in their return to the local league after a six year absence from the competition. This will be Ryan’s first year as a Division 1 coach. The three coaches remain a popular team with the Lara United senior girls, with both teams seeing the return of more past players this season, and all are looking forward to another positive and successful season. 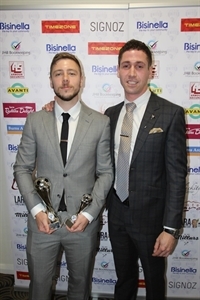 Lara United FC is pleased to announce the appointments of Leonardo Volpe and Jean-Paul Lavigne as the State League Assistant Senior Men’s and Assistant Reserve’s coaches for the 2019 season. It’s exciting to see such a strong coaching group established with such passion for the club and the technical experience to take our playing group to the next level. Leonardo Volpe has been involved in the sport since he was 8 years old, anyone that has spoken to him around the club will have seen the enormous passion that he has for the game. Leo has coached his sons Peter and Sam at Bell Park and more recently Lara United, guiding our 2017 under 17’s team to a final. With Peter and Sam set to play an instrumental role in the upcoming season Leo can’t wait to put his experience to work and help the team achieve its goals. After coaching the local league side in the 2018 season Jean-Paul Lavinge is relishing the challenge of stepping into the State League coaching setup. Jean-Paul has played junior and senior football for Lara United and his ability to build a club culture that the players want to be a part of makes him a huge asset to any team. We are very excited to have Jean-Paul Lavigne return for the 2019 season as our Local Senior Men's coach. Jean-Paul did an excellent job with the playing group last year that saw a number of players progress into our State League system. More information about training nights to come. Good luck for the season! Bisinella Developments is Lara United FC's Major Sponsor, proudly displayed on our club kits. 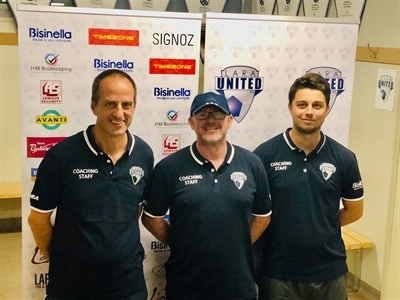 Bisinella has shown great support of football in our community for many years and we at Lara United are thankful to have Bisinella on board for season 2019. Providing the club with security for a number of years - thanks Gino! Location: 22 Cadman Tce, North Geelong. Contact Gino for your security needs. Pamper and look after yourself at Lara Day Spa & Wellness Centre, conveniently located at 37 Patullos Road, Lara. Facials,waxing, massages, hydrotherapy, health products. Open 6 days per week, gift vouchers available. 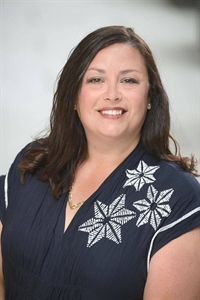 Judy has 27 years plus experience in finance management including payroll, accounts payable, accounts receivable, bank reconciliation, BAS and general ledger. Registered BAS Agent No. 94268000. 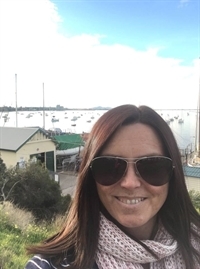 Judy is a Xero silver partner & discounted subscriptions to Xero software are available. Sponsoring a number of initiatives, including, girls' gala, junior regional reps & in 2018 our club marquee. Lifting the BAR in Lara. Servicing Lara and surrounding areas for all of your real estate needs, contact Craig, Brad, Jennifer & the team at Burns Archer Realty located in Station Lake Rd, Lara. See Jo & the team for all of your hair needs because we all know soccer hair is so important! Jo's daughters have both played for our club & we thank her for coming on board as a sponsor as well as for her support as a soccer mum. Located at the Centreway, Shop 16B, next to the Post Office, open 6 days a week.